Did Christianity Copy Other Religions? One of the charges levelled against the Christian faith is that Christianity copied other religions. It is held that there is not much, if anything, in either the Old or New Testaments of the Bible that cannot be found in the beliefs of other ancient religions - some of which pre-date the written Scriptures. Dr. Will Durant expresses this view in his history book "Caesar and Christ." Dr. Durant spends most of his book in an excellent history of the customs, society, beliefs and development of the Roman civilization. When he gets to the "New Testament times" and turns his focus to Jesus and the development of the Church, he accepts most of the "history" recorded in the Gospels and Acts as accurate while rejecting the supernatural elements. Although his book was published in 1944, the view presented below represents the view of many outside the Christian faith today. The general idea is that a lot of ancient religions held similar beliefs to the Jews [in the Old Testament] and the Christians [in the New Testament] so that the Jews and Christians simply adapted the cultural beliefs of their time to their purposes. The thought is that there is nothing really unique in the teaching of the Bible, but that Christianity copied other religions, and eventually surpassed them, to become what it is today. Is this charge correct? Before we look at the facts, I want to clarify one thing. It is true that as the Church developed after the time of the original apostles, into what we know as the Catholic Church today, it did adapt some pagan practices into its rituals and belief system. Much of this was exposed durning the Reformation and that is not want I am dealing with here, nor is it what I think the majority of people who hold the above view are referring to. The question is: Did the writers of Bible in its original teachings copy from other religions? We can all understand and admit that corruptions can creep in over time [and need to be weeded out], but what about the original teachings? 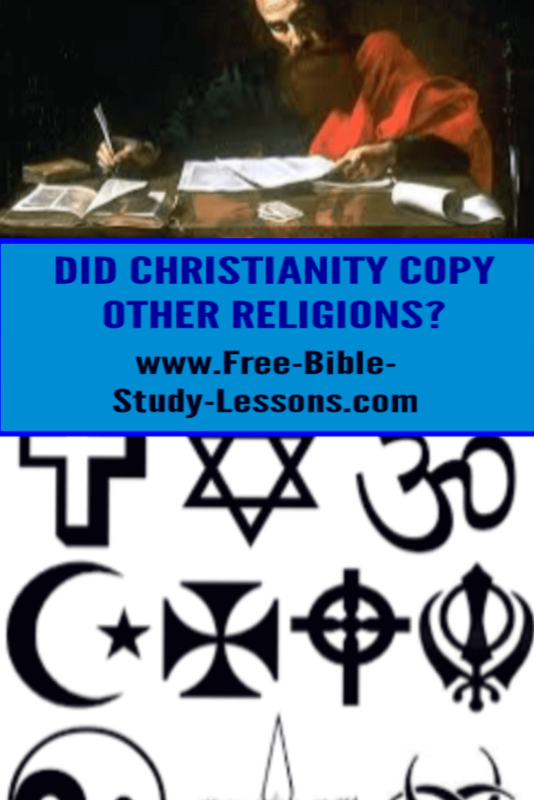 Did Christianity copy other religions? Is it just a late copycat? 1. Many ancient religions do contain teachings similar to those found in the Bible. These include, a virgin birth, a holy mother and child, a god who dies to save the world, life after death, resurrection, etc. All the exact details are not important in this discussion, it is enough to admit that there appears to be very little original content in the basic doctrines of the Bible. How we understand these two facts depends on our presuppositions. Presuppositions are beliefs that we take by faith and then build our world view on them. It does not matter if you are an atheist or a Christian or somewhere in between, you have built your life on presuppositions. That is just the ways things work. Now, obviously, some presuppositions are correct and some are wrong [be sure you are building your life on the right ones!]. If we begin with humanistic presuppositions [such as: there is no God, everything has a natural explanation, man is the centre, religion was part of man's evolutionary development, etc. ], we are going to come to a conclusion like Dr. Durant did. We are going to look at those two facts and say, "See that proves Christianity is, at best, a copycat, at worst, a shallow hoax. It simply took what was already there and developed it to its own purposes." Given the beginning presuppositions, that would be a logical conclusion. Christianity copied other religions. It was just another advance in human evolutionary development and now we have reached a stage in evolution where religion is no longer necessary, at least, for the most intellectual among us. But that is not the only way we can look at those facts. If we begin with Christian presuppositions [such as: God is real, the Bible is the infallible Word of God, Jesus is God, etc], we can see evidence for the Bible and Christianity in the above facts. How? The fact that there are many similarities between the Bible and other religions does not necessarily mean that Christianity copied other religions, it can mean that they all came from a common source. And this is exactly what we would expect if the Bible is true. There should be no surprise here at all. Consider Adam and Eve [Gen. 1-4]. We see that the entire human race began with two people. They disobeyed God and were cast out of Eden. If they are the original parents, as the Bible teaches, they would have passed down everything that happened to their children who would have told their children, etc. In fact, Adam lived for over half the time between creation and the Flood which means that there was a living eye witness around until about 700 years before the Flood. Considering our first verse, we can see that sin separates man from God and man's natural reaction is to try and hide from God. It is not surprising then that as mankind developed he invented many religious systems as "fig leaves" to try and hide from God. Non-Christian religions are still man's attempt to hide from the true God. Nor should it be shocking that as man wove his own religion he would use elements from what was true and turn them to his own purposes. So it is perfectly logical and expected to find stories of man cast out of paradise, angry gods, blood sacrifices etc. in ancient religions. In fact, if you look at Gen. 3:15 [above] you can see that God spoke of the offspring of the woman [not the man as would be expected] fighting against the serpent. So, again, it is to be expected that we would find stories in ancient religions involving an important woman [sometimes a virgin] and child, a great struggle of good and evil, a painful victory, a fight against a snake or snake-like god. If we look at Noah and the Flood we again find a common source for many of the stories in ancient religions. Most, if not all, ancient religions have a story of a man who, with his family, survived a great flood [sometimes local, sometimes global] and restarted the human family or a portion of it. While the humanist may argue that religions copied this story from each other, it makes more sense to me that there was one event from which all religions drew their main ideas. Again, keep in mind that Noah's son, Seth, lived until after Isaac married Rebekah. There was, at least, one eye witness around for a long time! The humanist idea is copycat religions evolving over time. The other possibility is a common source corrupted and changed over time to fit man's attempt to hide from the true God. Which one you accept will depend on your presuppositions. Obviously someone is right and someone is wrong. What about the fact that some of the ancient religions had these ideas written down before the first books of the Bible were written? Doesn't that support the idea that the Bible copied from other religions? Actually, it is not surprising at all. Lamech, who was a descendant of Cain, had three sons. One developed husbandry, one developed musical instruments and one invented and worked with tools. We see here technological development happening early in the ungodly line of Cain. The Godly line of Seth seemed to have a more pastoral life. Certainly, at the time of Abraham, they became nomadic and focused on being shepherds, etc. Therefore, we would except writing to develop in other cultures first. It then follows that other cultures/religions would have written their accounts first. That does not automatically mean that their version is the correct one. But since the Hebrews and their forerunners did not write things down until a later date, would it not have been easy for them to mix up the details? Would it not be more likely that Moses got it wrong and one of the others got it right or that all the stories are corruptions of original events? Good question, but its basic assumptions are humanistic and evolutionary. Adam was created as a perfect human being. He used, for example, his mental abilities to their fullest capacity. From our point-of-view, he would have seemed super-intelligent. The Christian view is that man started at the top and has progressively declined since. We use computers for things that Adam could probably do almost instantly in his mind. [This explains why some ancient cultures were advanced and doing things we still do not know how to do - to the surprise of modern scientists. It is the evolutionary assumption that man began as a "brute beast" and is developing into a super-intelligent being. As expected, the opposite of reality.] There is really no issue with people being able to accurately relay the true story from generation to generation without error. Even today there are people in "primitive" tribes who can recite their history from previous generations without error. Also, keep in mind, that the time from the Flood to the Exodus can be traced in the lifetimes of 6 - 7 people. Having said all of that, there is one way in which Christianity is totally unique. As previously mentioned, all religions - including humanism - are man's attempt to hide from God. They have taken the facts and distorted or corrupted them to fit into what man's idea of religion is. In every case, it involves some kind of legalism. There is some system of rules, sacrifices, or rituals by which man can earn or achieve salvation. Only true Christianity stands up and says, "Because our nature is corrupted by sin, there is NOTHING we can do to please God." We can never earn our salvation. But the Good News of Christianity is that God, in Jesus, has earned salvation on our behalf. Now all we have to do is accept it as a free gift. The Truth stands alone.